Error Code Love seems like an oh-so-familiar story of obsessive, compulsive love, but debutante novelist Suman Bhattacharya’s dexterous handling of the theme gives a refreshing touch to the tale. What I particularly loved was Suman’s asides — self-deprecating, funny, sarcastic, double-entendres — while narrating the story. The prose is non-pretentious with no claims to literary merit, but it is the simple, fast-paced and bubbly language that works well for the story and jells superbly for the target audience of young readers. 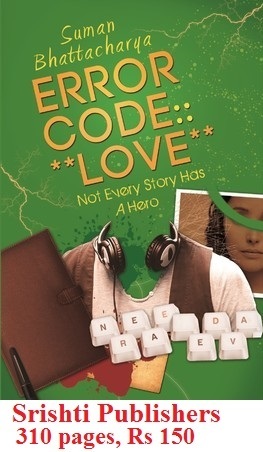 The protagonist Dev is not the archetypal hero … in fact, he is a ‘non-hero’, as the novel’s subtitle so aptly reveals, ‘Not Every Story Has A Hero.’ Dev’s love for Neera is more like an obsessive compulsive disorder that seems to destroy and consume rather than nurture those good feelings that bring two people together. Well, one doesn’t expect altruistic, unconditional love from a modern novel’s hero, but apart from being clinging and clawing, Dev’s love appears desperate and self-centred. Dev doesn’t hesitate to play around with the emotions of his friend Isha and make her a pawn in his game of love with Neera. It is in 2008 when Dev’s crazy, compulsive love for Neera drives him to commit the biggest mistake of his life. In 72 dramatic hours, the promising software engineer loses his career, love and life by a single act of madness. In Bengaluru four years later, Dev seeks redemption and a better life. However, destiny brings him face-to-face with Neera once again. He chases the same impossible dream again. His obsession for her returns with a vengeance and Dev finds the madness of love striking back with double force, threatening to shatter his life beyond repair. Will our anti-hero ever get his life back into shape again? Revealing more will spoil the fun of this highly readable novel. The story with some delightful twists and turns has a climax that seems straight out of a Bollywood pot-boiler. 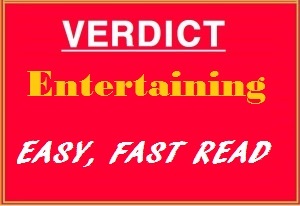 But don’t let this disappoint you, for this novel really has great entertainment value.